With the universal catholic (Christian) Church of all time, The Lutheran Church – Missouri Synod (and joyfully this Parish, as well) believes, teaches, and confesses that there is only one True God. He is the God who has revealed Himself in Holy Scripture as the Triune God: Father, Son and Holy Spirit – the Father, Creator of all that exists; Jesus Christ, the very Son of God, who became fully human through His virgin mother, Mary, to suffer and die for the sins of all mankind, and then rose to life again in victory over sin, death and Satan; and the Holy Spirit, who creates faith through God's appointed "Means of Grace" – that is, through Word and Sacraments. The three Persons of the Trinity are coequal and coeternal, one God. When we confess that we are "Lutheran," what we mean is that our Parish both accepts and embraces the Bible-based teachings of Martin Luther, which were the driving force not only for the Reformation of the Church in the 16th century, but which are also written down in the Confessional writings of our Church as found in the Book of Concord of 1580. 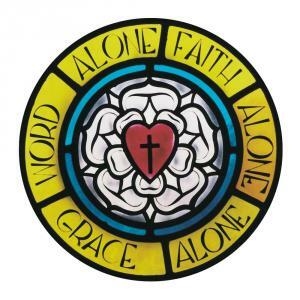 Basically, the teachings of Luther and the other Lutheran Reformers can be summarized in three short phrases: Grace alone, Scripture alone, and Faith alone. Grace alone means that we believe, teach and confess – according to the clear words of Holy Scripture – that God loves the people of the world so much that even though they are all sinful through and through – though they rebel against Him at every opportunity and don’t deserve His love in the slightest – He still resolved to keep the promise that He made with Adam and Eve in the Garden (Genesis 3:15) to send His Only Begotten Son, Jesus Christ into the world to atone for the sins of all, and thus to save mankind for eternal life through faith in His vicarious life, suffering, death and resurrection (John 3:16 & II Corinthians 5:19). Scripture alone means that we believe, teach and confess that the Bible alone, of all other Books in the world, is God's inerrant and infallible Word, that means whereby He reveals His Law and His Gospel which draws sinners to partake of the salvation earned for all by Jesus Christ. The Holy Scriptures alone are the sole Rule and Norm for all Christian doctrine and practice, and are authoritative in every topic to which they speak. (II Timothy 3:16 ff). Faith alone means we believe, teach and confess that by Christ’s bitter suffering and death, our dear Savior willingly allowed Himself to be the Substitute and Payment for the sins of all people – and of all time. Through that gracious, meritorious action, our Lord Christ was able thereby to purchase and win forgiveness and eternal life for all who would trust in Him as Savior. Those who hear this Good News and believe it have the promise that the eternal life freely offered there by God for Christ’s sake will be theirs. It is God alone who creates faith in Christ – and it is only through faith in Christ alone that anyone can ever hope to be saved. (Ephesians 2:8-9). We also believe, teach and confess that the only means whereby this faith is created and sustained is through the clear proclamation of God’s Word in the Divine Service, Confession and Absolution, water Baptism in the name of the Triune God, and worthy reception of the Sacrament of Christ’s body and blood given and received under bread in wine in the Holy Mystery of the Lord’s Supper (I Corinthians 11:27-29). The word "Synod" – as in The Lutheran Church – Missouri Synod – comes from the Greek, and means "walking together." Historically this has had rich meaning in our Church Body, because of the fact that each of the congregations so affiliated have voluntarily chosen to belong to the Synod – and therein to adhere to a common belief, faith, and practice. Those who have chosen to make themselves one with our Synod have agreed to both publicly and privately hold to a commonly shared confession of Jesus Christ as taught in Holy Scripture and confessed in the Lutheran Confessions - although sadly, in our day, there are some in the Synod who no longer hold to this Confession, and for that we are greatly saddened and will work to restore that Synod once again among us by means of the Scriptures and our Confessions. The congregations of the Lutheran Church – Missouri Synod who still hold to the aforementioned teachings are therefore "Confessional" in that they hold and confess that the Lutheran Confessions (as found in the Book of Concord of 1580 are the only correct interpretation and exposition of Biblical doctrine. These statements of belief were put into writing by the Church’s leaders during the 16th century. (The simplest of these is Luther's Small Catechism, while the The Augsburg Confession gives more detail on what Lutherans believe).